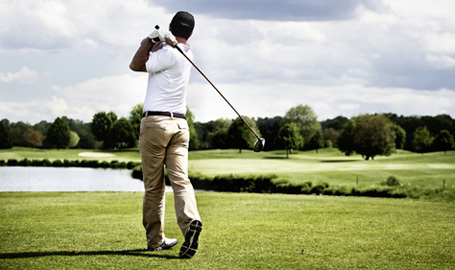 Don’t let poor alignment and avoidable repetative stress injuries spoil your round. Footbalance custom insoles support your feet properly to help you prevent stress injuries while improving mechanical efficiency, form and consistency. Misalignment in the feet and ankles affects overall body alignment and efficiency, negatively affecting stability, stance and swing. Misalignment in the feet makes for an uneven platform for the body, forcing knee and hip outward. This interferes with your contact with the course and puts the pelvis into a closed position, preventing it from rotating freely during the swing. Body loading is incorrect causing unnecessary strain when you repeat the same motions over and over again. This can lead to pain, soft tissue damage and premature wear on the knees and hips. Feet tire faster when walking the course. Footbalance insoles support your feet in proper alignment for better stability, balance and consistency in each round. Proper foot and ankle alignment improves your stance. The feet form a more stable platform for superior course contact. Your body is free to carry out a full swing with better power transfer and increased efficiency. The unnecessary muscle strain, pain and wear on joints due to incorrect loading are reduced. Foot fatigue decreases. All this helps you improve consistency, overall endurance and enjoyment of each round.